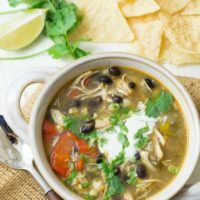 Taco chicken soup is an easy taco soup recipe with chicken, black beans, fresh vegetables, and Mexican spices. 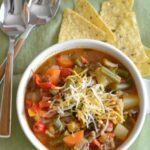 This gluten free taco soup recipe is kid approved, too! Sometimes you make a soup and it is an unexpected hit. 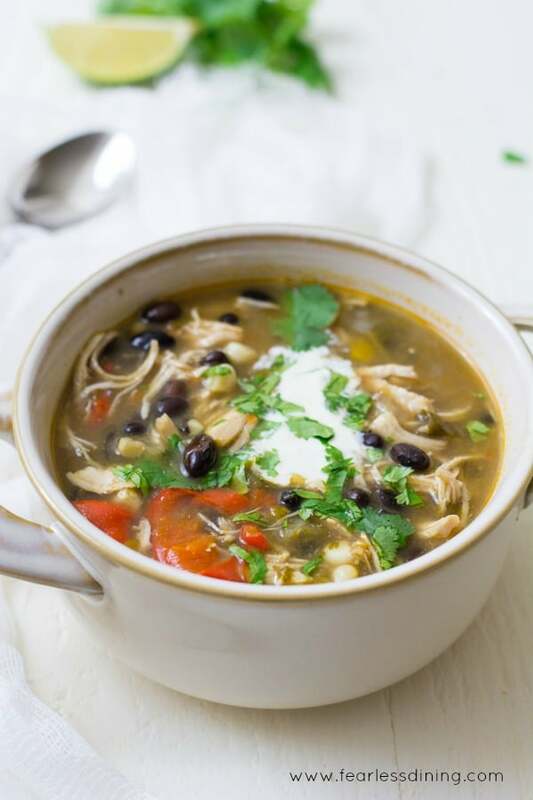 This shredded chicken taco soup is one of those delicious surprises! 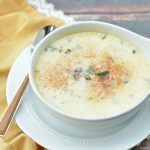 You will want to check out all of my homemade chicken soup recipes…you are guaranteed to find your next favorite! 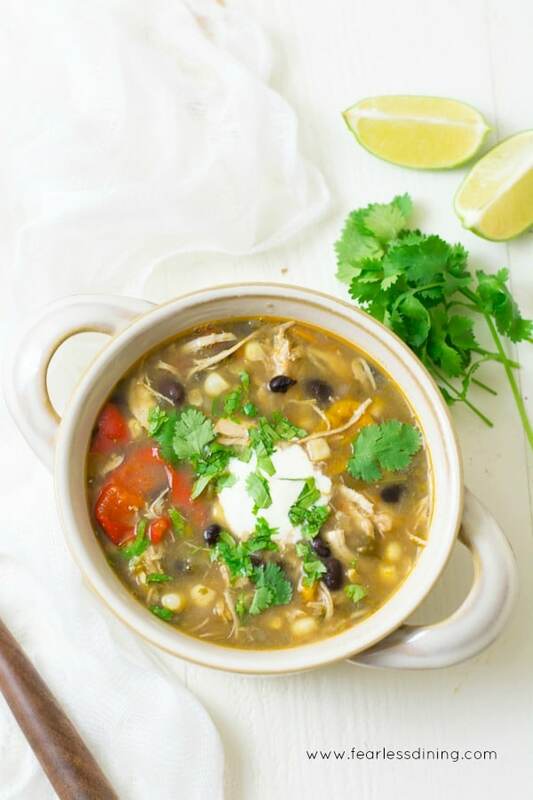 This taco soup has lots of shredded low fat chicken breast and vegetables. This week’s organic farm box had the first green beans of the season. Our family loves green beans, both raw and in soups. There was another great surprise….green garlic! 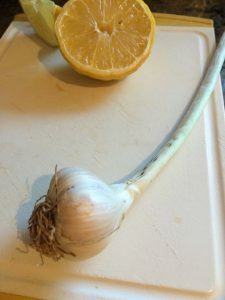 Have you tried green garlic? 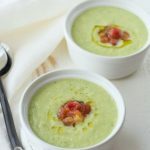 It is only available for a short time in the spring, but it has an incredible, mild flavor that is so good in soups and other recipes. It is also the tail end of the season for fresh green garlic, one of my favorites. It adds a fresh, yet milder garlic flavor to your cooking. The older the green garlic gets, the stronger the garlic flavor. What vegetables will you use in this healthy taco soup recipe? 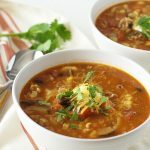 This taco soup with chicken is almost always adaptable to the vegetables you have in your refrigerator. Nothing drives me crazier than when veggies go bad in the back of the refrigerator!! If you only have zucchini and onion, use those in your healthy taco soup recipe! Add two raw whole chicken breasts, broth, spices, and water. Bring to boil, then reduce heat to medium low. Using two forks, shred chicken breasts and then return to the pot. Allow to cook 5 minutes. Serve with crushed corn tortillas, cheese, and green onions on top. 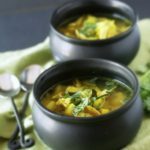 9 More Yummy Soup Options! I hope I can find all the ingredients, if not, I hope I still can make the soup with good taste. Sorry to make you hungry so late Natalie 🙂 I hope you get a chance to make this soup soon. I’m so chilly all the time lately, I need to make this delicious chicken soup to warm up! 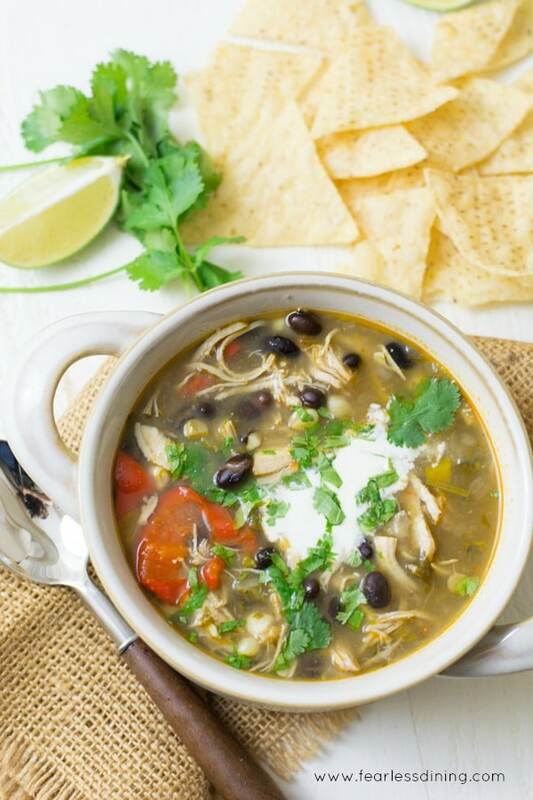 Enjoy Emily, this chicken taco soup recipe is a winner! I love green garlic, it gives dishes SO much flavour! This soup is loaded with so much flavour I think I’d have the whole pot to myself! haha 😀 Yummy! I am so glad you are able to find green garlic where you are Joyce. What are your favorite recipes to use it in? Oh my goodness, I am so jealous that you have these ingredients right now. It is so cold here in Vermont and it will be months and months before green garlic or green beans are ready. Love this soup though. A healthy soup would definitely hit the spot today. Oh man, I am from New Hampshire so I completely know how cold it can be there…hopefully you will thaw out soon. I love any type of Mexican-inspired soups, they’re so comforting and delicious in the cooler months of the year. This looks super comforting. I make something like this whenever anyone in our house is feeling ill and it always perks them up. Thank you Dannii, this is a great soup for when someone has a cold. I tried this soup for the first time last night. Actually, it’s my first soup ever. It turned out great. Except this recipe didn’t say when to put in the spices (cumin or chili powder). When I realized that, I had the chicken & water in already, which I’m sure was fine. I think when I have the left overs, I will leave the cheese out, horrible clean up! Oh, you are right Tammy. Thank you so much for letting me know. I tend to dump in the spices when I add the chicken and water. I will add this in. I appreciate your taking the time to write. This is going on my menu. Wonderful flavors Sandi. You are so right. This soup is a meal by itself. It looks very hearty and satisfying. It has definitely been soup weather lately. And when the air is crisp, there’s nothing better than a delicious soup! Fabulous. I love fall soups! This looks so good! Its gray, rainy day today. I think this is what we’ll have for dinner tonight! oohh yum! I bet this would be great any time of year. pinning! Love the added green beans – why not! Also love how hearty this soup is – so nice! I love taco soup and your rendition, with this chicken, looks incredibly appetizing and nutritious. Very nicely done! What a mouthwatering soup Sandi! What a delicious soup Sandi. I’m looking forward to trying it! This is a perfect recipe for Cinco De Mayo. I love Mexican and this soup is perfect and right up my alley! This soup looks so delicious and comforting. I’d love a bowl or 2 on this cloudy day.